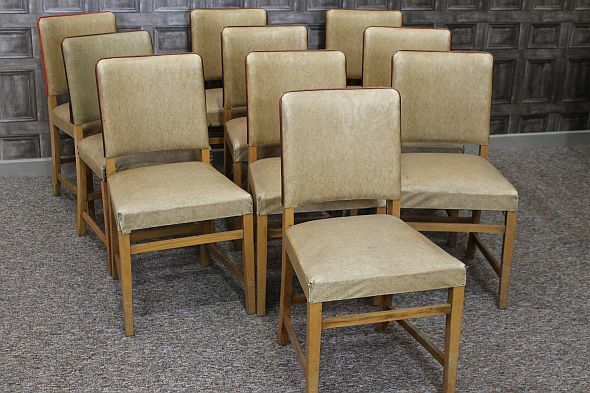 These Art Deco dining chairs are a fantastic addition to our large and extensive range of vintage and antique chairs. These chairs have recently been removed from a large hotel, where they were used in the dining room. They have been in storage for over fifty years, and are in reasonable condition. As you can appreciate, there is wear and tear apparent on these chairs. We believe that if the chair legs were re-polished, and the chairs were re-upholstered (top layer of material only), these would be superb Art Deco dining chairs. Please contact us if you require larger quantities. We will be listing some red covered chairs in the near future. Please note that the price stated is for one of our Art Deco dining chairs.